Since its 1995 introduction, the Hyundai Accent has been one of the better-built, better-performing choices at the bottom end of the new car market. Although grouped with similarly priced subcompact cars, the Accent sedan and hatchback have always fallen under the EPA's classification for a compact car, which translates to a surprisingly roomy interior. Other typical Accent advantages include generous standard equipment and long warranty coverage. The latest Accent iteration has made great strides toward front-runner status in this competitive segment, which is a welcome change from past models. It is now larger inside and out than before, and the overall look of the car is certainly more dynamic. Performance has been improved as well. Prior to the current-generation car, older Accents suffered from low safety ratings and an overall level of quality that doesn't match up to some competing economy cars. But for the most part, these models represent a sensible choice among budget sedans and hatchbacks. Hyundai released the Korean version of the Accent (RB series) on November 2010. The new model is offered with the same 1.6 liter engine and 6-speed automatic or 6-speed manual as the fifth-generation (MD) Elantra. The car reverted to the "Accent" name as used in the X3 series. 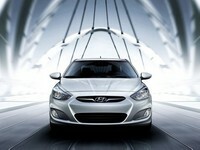 The hatchback version, called Accent WIT, replaces the Getz/Click in South Korea. The third generation of the Accent, known as project MC, was introduced at the 2005 New York International Auto Show. Again, the car grew just a tad--an inch wider, 1.8 inches longer and 3 inches taller. Like the second-generation model, the Accent was available in a two-door hatchback and a four-door sedan. It was sold starting with the 2006 model year, and featured a four-cylinder 1.6-L engine, available with either a manual or automatic transmission. The Accent was redesigned for the 2000 model year, and the product line reduced to just two models: a two-door hatchback and a four-door sedan. These vehicles originally came with a 1.5-L engine, but a 1.6-L engine replaced that in 2001. The second-generation Accent was slightly bigger--and slightly more comfortable--than its predecessor. Originally known within the company as Project X3, the Accent first hit the market with the 1995 model year. The vehicle was meant to be a replacement for the economical Hyundai Excel, and kept that name in some nations. Three versions of the Accent were available: a sedan, a saloon and a coupe, with either a 1.3-L engine or an upgraded 1.5-L engine.